Culicoides midges belong to the order Diptera (2 winged flies), genus Culicoides. Culicoides are significant to livestock production as they are able transmit diseases such as Bluetongue to cattle and sheep. Culicoides play an important role as the vector of emerging viruses in Europe. In Western and Northern Europe it has been determined that local Culicoides species are vectors of BTV and not species that have migrated from southern areas. 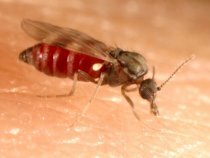 The African species Culicoides imicola has been determined as the main vector of BTV outbreaks in Africa and Southern Europe. In Western-central Europe the virus has been isolated by Real-Time-PCR technique from Culicoides obsoletus. BTV has been isolated from Culicoides obsoletus a local midge species of Northern and Western Europe. The African species Culicoides imicola is the main vector of BTV outbreaks in Africa and Southern Europe. See the Bluetongue website for more information about Culicoides and the transmission of Bluetongue. 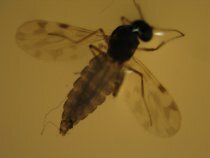 Culicoides midges, the only identified vector of BTV.